I scored this CD around 1998 when i was starting to purge my record collection. I traded a Mercyful Fate Melissa 12″ picture disc for it to some dude in Canada. In 1999 I went to Richmond, VA to see Nevermore and did an interview with Warrell Dane. I asked him about this ep and he stated that about 1000 were made and only about 500 actually got released to record stores and radio stations as a promo. The others were destroyed when CBS dropped Sanctuary from their label. He did say, however, that he still had the master reels from this recording and wanted to put the whole show out officially. Obviously 11 years later I don’t think it’s going to happen. What a pity. This is a great recording although I wish White Rabbit would have been left out. I always loved their cover of White Rabbit. anybody heard Warrell’s latest solo release? 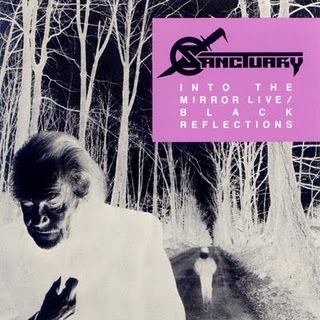 I am sure everyones heard the crazy story of how they (SANCTUARY) were “discovered” by Dave Mustaine? if not, stay tuned for a future post in Demolish Mag. for the scoop as told by Lenny Rutledge.